Whether as wall paint, for upholstered furniture, accessories or for kitchen and living area furniture: the colour black has returned to our home environment. Thanks to innovative illumination technologies and new materials, black surfaces can now be effectively built into attractive interior designs. Ostermann provides the matching accessories for the construction of deep dark furniture. Dark or black surfaces have a fine, high-class look. Moreover, they can be combined with other colours in the room. Meanwhile, not all blacks are the same. The dark shades are available in diverse variations. You can create modern furniture in "industrial style" using black steel and dark concrete. In case you wish for something more natural, you should go for black wood decors. Super matt or matt black surfaces appear particularly homely. Due to new technologies, such as anti-fingerprint coatings, they are easy to care for. 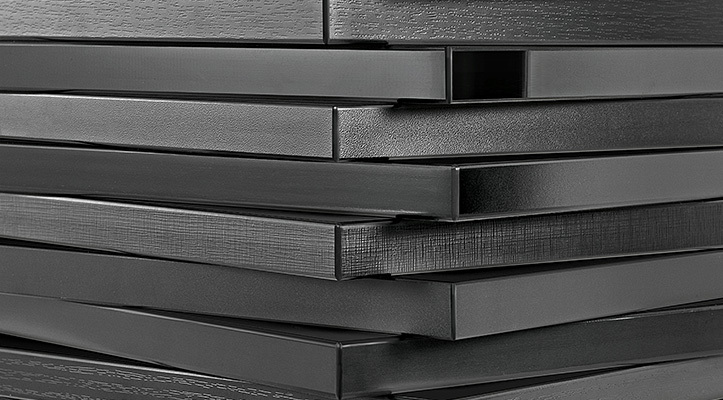 Within the wide range of Ostermann, there are numerous plain edgings in black that are an ideal solution for the construction of cutting-edge furniture. Different embossings and gloss grades ensure that they match the surface perfectly. Our special tip are edgings with dark decor surfaces, as for example the ABS edging "Monocrete" with an attractive concrete decor, or the ABS edgings "Raja Black" and "Black Marble" that appear in the cutting-edge marble look. For the construction of small but nice individual elements, Ostermann provides ABS edgings from a length of 1 metre, and in many widths and thicknesses. The edging range is rounded off by a great choice of black melamine edgings. From furniture linoleum to RollMokutan, profiles, handle profiles and black furniture handles: Ostermann provides the carpenter/cabinetmaker with everything they need for the construction of trendy black furniture. Type in "blackisback" into the search field of the start page of the Ostermann online shop and you will find the entire selection. For advice via telephone, highly trained sales employees will be at your service. Especially noteworthy is the quick delivery of stocked merchandise: all orders placed by 4 pm wil be delivered within 24 hours.